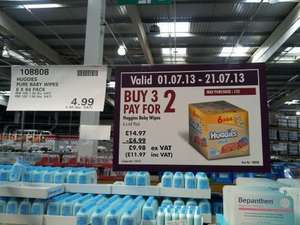 Slightly cheaper than previous deals in other stores. im sure theyre £2.29 in superdrug buy one get two free? What wipes do you use? Does it really matter? Theres plenty of other alternatives. If you're not a Costco member, tesco have 9 pack on offer just now for £6.29. Pampers and Johnsons are the only ones we seem to get on with. These are utter carp - a bit like soggy paper and impossible to get out of the packet or separate. Didn't like Boots and Sainsburys own brand either. Pampers and Johnsons are the only ones we seem to get on with. These are … Pampers and Johnsons are the only ones we seem to get on with. These are utter carp - a bit like soggy paper and impossible to get out of the packet or separate. Didn't like Boots and Sainsburys own brand either. Are you serious they are like a cheap rag full of soap, even my doctor recommended not using them.